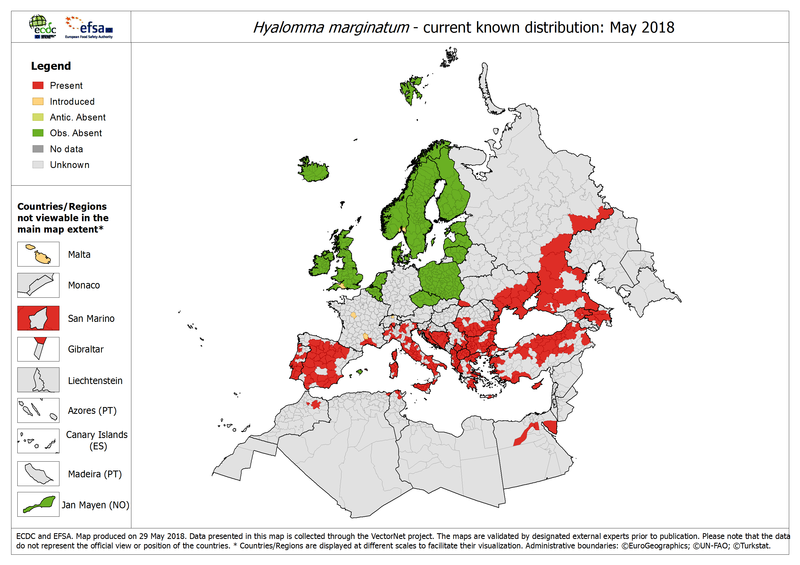 The map shows the current known distribution of Hyalomma marginatum in Europe at at ‘regional’ administrative level (NUTS3), as of May 2018. The VectorNet maps are published regularly on the website to provide the ECDC stakeholders and the general public with the most up-to-date information on vector distribution. The map shows the current known distribution of Ixodes ricinus in Europe at ‘regional’ administrative level (NUTS3), as of June 2018. The map shows the current known distribution of Ixodes persulcatus in Europe at at ‘regional’ administrative level (NUTS3), as of May 2018. The map shows the current known distribution of Rhipicephalus sanguineus in Europe at at ‘regional’ administrative level (NUTS3), as of May 2018. The map shows the current known distribution of Dermacentor reticulatus in Europe at at ‘regional’ administrative level (NUTS3), as of May 2018. The map shows the current known distribution of the tick species in Europe at ‘regional’ administrative level (NUTS3).